UPDATE: Today is the day folks! 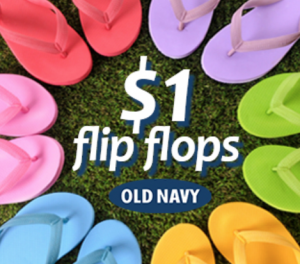 I wanted to give you all a heads up that Old Navy will be offering solid colored flip-flops for just $1.00 on June 23rd – no coupon needed! Mark your calendars if you’re in need or want of new flip flops! And get there early because they tend to sell out fast! There is a limit of 10 per customer. 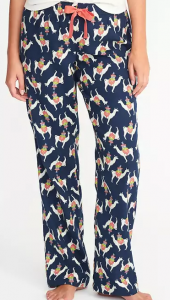 Here is a great deal on Old Navy pajama bottoms for Women & Men! Old Navy is currently offering Men’s flannel sleep pants and Women’s flannel sleep pants for just $5.00 each (regularly $16.99)! 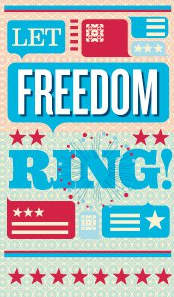 And even sweeter, for today only (12/15), OldNavy.com is offering FREE Shipping on every order when you use the code SHIPDAY at checkout. 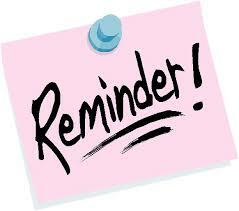 And, orders placed by December 19th will arrive in time for Christmas! So you will end up paying just $5.00 for a pair of pajama pants with code SHIPDAY at checkout! You can snag this deal in-store or online today ONLY. 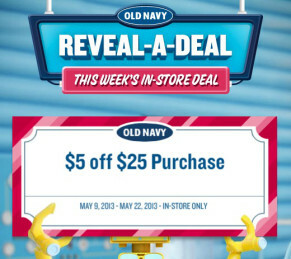 The Old Navy Facebook page and click on the “Reveal-A-Deal” tab to print a coupon valid for $5 off any $25 in-store purchase! This coupon should help you score some amazing deals at Old Navy! 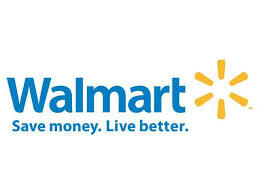 Coupon is valid 5/9 – 5/22! Now through October 14th, you can snag 30% off your entire purchase at Old Navy! You can either print this coupon or show it on your smart phone to save ink! Valid in-stores only. Old Navy: Take $15 Off Your Online Purchase, Even Fall Sale Items! Right now at Old Navy, you can snag $15 off your online purchase of $75.00 or more, even fall sale items! 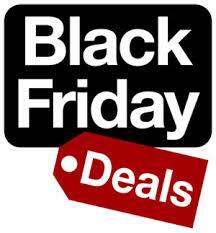 This is a great time to save on your Christmas shopping! Simply enter code ONFALL15 at checkout, offer ends 10/14! Old Navy: $4 Deals For The Whole Family!! Old Navy is having a $4 Deals for the Family Sale (in-store only) starting Friday July 29 – Saturday July 30 from 9:00 am – 9:00 pm. 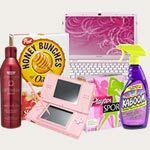 With deals like these, its the perfect time to do some back to school shopping…see ya there! Swim for all at $4! Basic graphic tees for adults and kids at $4! Basic Tees starting at $4! Valid 7/29/2011 and 7/30/2011 at Old Navy stores in the United States only. 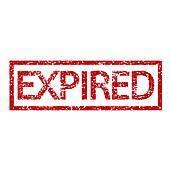 Excludes clearance and Baby Graphic tees, Collectabilitees, Sports and Elevated tees. Select styles only. While supplies last. Old Navy is offering Buy 2 Items and Get The Third Item FREE . This offer is valid In-Store only and valid until July 4! 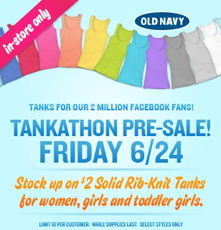 Old Navy has reached 2,000,000 fans on Facebook and to celebrate they are offering a $2 Solid Rib-Knit Tanks Printable Coupon, valid Friday 6/24. This is for women’s, girls, and toddler girl tanks!